Have you ever felt the urge to dash across a sunny meadow, arms outspread, heart wide open? Do your senses come alive with the effervescent energy of spring’s blooming fragrance? When standing near ancient oaks and redwoods, do you feel a calm and quiet within you? Your body is responding to its innate connection to the natural world! These impulses and sensory awakenings are a call to connect to the other-than-human life forms around you and to remember your natural self. When you feel moved by the strength of sheer cliffs, a sunset’s dynamic vibrancy, or gentle lapping waves, you are being invited to feel your embodied humanness. A willow tree’s beckoning sway and the trickling motion of a stream can inspire our body’s capacity to move. These entities are also sentient presences ready to share a relationship with us. The natural world offers a level of generosity and replenishment that most of us forget is possible in our overstretched lives. How can we develop this connection and join in the natural movement around us? You can start by feeling your sensory connection to a natural element and allowing that to expand into movement. It’s surprisingly easy and immediately gratifying. Moving in the wild is in our bones. Our indigenous ancestors danced in rituals to celebrate all aspects of life: birth, death, harvest and rites of passage. They communicated with the spirits of the land and moved with these spirits in ceremony. Dancing in the wild is making a comeback with a modern twist. People are exploring this at nature and yoga festivals, weekend workshops and in university classes. Yet, how do you begin or experiment without feeling awkward or uncomfortable? An easy entree is joining a day workshop which can introduce you to simple practices for your daily life. It’s fun and inspiring to explore new edges with a skilled guide and group’s enthusiasm. Our bodies and nervous systems thrive in connecting with the infinite diversity of plants, rocks and water. Environmental novelty wakes up our senses and inspires us to get out of our mental cages to see life beyond our screens. How do we make the transition to moving with nature? Here’s a simple, widely enjoyed exercise to open your senses, come into the present moment and build intimacy with a partner, friend or family member. It’s also great for slowing down and relaxing. Sense walk: Find an outdoor area preferably with a variety of plants, rocks, and natural elements.The person to go first closes their eyes, and partner holds their hand or shoulder for safety and guidance. With minimal words, guide your partner to touch, smell and listen to specific elements around you. You can bring their hand to touch the texture of tree bark, or place a rock on their palm, and include other parts of the body as well. Have fun and be creative. Tune in to your partner’s pacing, allowing them time to investigate each experience. Allow 5-10 minutes for each person’s turn. Before you talk about your experiences, switch roles. Share about what you enjoyed and felt. Dancing with nature: Look around and choose a natural element that draws you. Visually notice everything about it: size, texture, patterns, solidness, fragility, expansiveness… Become conscious of the presence of this life form and acknowledge it. Like a dancing partner, feel your energetic relationship with this partner. Notice the sensations waking up in your body as you connect to this being: a heart softening, weightiness or arms wanting to stretch. Let subtle or expansive movements evolve naturally in response to these sensations. When you feel satisfied with your dance, make sure to thank your partner, knowing you can come back to this partner or carry this experience within you. Many Bay Area outdoor movement events are coming up soon. Earth Ecstatics and Back to Earth Outdoors offer a nature connection series in spring and summer. 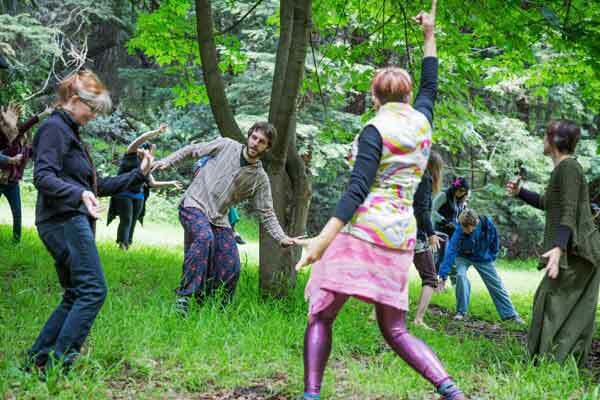 Bay Area Dance Week in April has hundreds of free dance opportunities, including “Dancing with the Earth” in the Oakland hills. Body Tales offers seasonal retreats weaving together body, earth and inner world explorations. Anna Halprin’s Planetary Dance for peace on Mt.Tamalpais happens yearly in June.